Cloudy with a chance of crystals: is this weather on a giant exoplanet? First observations of weather-like changes on a massive planet outside our solar system – but they're unlike anything on Earth. Belinda Smith reports. What may be cloud cover has been spotted on a "hot Jupiter" gas giant planet, circling a star around 1,000 light-years away. Astronomers in the UK measured the brightness of the exoplanet HAT-P-7b over four years, and found it brightened and dimmed regularly. This, they report in Nature Astronomy, may be because winds swirling around the planet push flurries of mineral clouds to the day side so the planet reflects more light. We're well acquainted with the array of weather systems in our solar system, from the gigantic storms on Jupiter to Venus' lightning and acid rain, thanks to the legions of probes we've sent to explore. But detecting an exoplanet's weather – actually, detecting an exoplanet at all – is a whole different story. We can't see exoplanets directly (yet). A star's luminosity will usually overwhelm any light its planets might reflect. 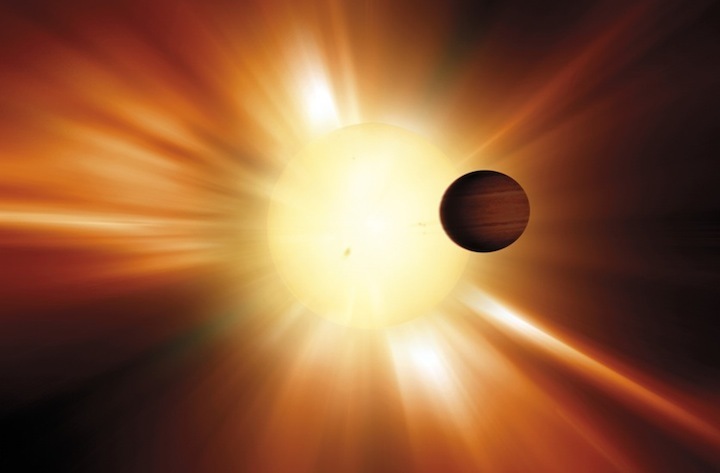 So exoplanet presence is inferred through means such as the transit method, which measures the dip in a star's light as a planet moves between it and Earth. It was using the transit method that, in 2008, the exoplanet HAT-P-7b was found hurling around the star HAT-P-7 once every two days. Its radius is thought to be around 1.4 times that of Jupiter and given its proximity to its star, is extremely hot. It averages around 2,200 kelvin (1,927 ºC), with its day side reaching a blistering 2,860 kelvin (2,587 ºC). Large-scale weather systems are expected on these so-called "hot Jupiters" but no one had found substantial evidence yet. So to try to find weather clues, David Armstrong from the University of Warwick and colleagues analysed four years' of data taken by the Kepler Space Telescope between May 2009 and May 2013. They thought that if there was variable cloud cover on HAT-P-7, it might manifest itself as slight changes in brightness. Just as clouds on Earth reflect light back into space, so too would cloud on HAT-P-7. Indeed, they found peaks and troughs of luminosity and these changed over time. Circulation models for similar exoplanets suggest the clouds aren't water, but tiny crystals of minerals such as corundum and perovskite that would condense on the cooler night-side of the planet. The researchers modelled how wind speeds and condensates might affect HAT-P-7's brightness flux and found condensation temperatures between 1,600 kelvin and 2,200 kelvin could do the trick. While the overall temperature of the exoplanet is hotter than this range, the morning terminator – the line separating the day side from the night – could be cool enough. They suggest condensates form at the night side before being whipped around the planet by strong winds. Variations in wind speed could account for the dips and troughs in brightness. Armstrong and his crew note that their work opens the prospect of monitoring weather changes on exoplanets in the future. Planned space missions such as the James Webb Space Telescope will, no doubt, help track exoplanets in greater detail than ever before.